There are mystery men who played for Arsenal, and then there is Sydney Cartwright. He played 16 times for the glorious Arsenal team of the 1930s, and yet very, very little is known of him. There are two stories about his club/s before Arsenal. Some reports refer to him playing for Kiveton Park FC (near Rotherham and Sheffield) while others refer to High Moor FC. I’ll deal with them in turn before coming to his time at Arsenal. Certainly Cartwright was born in Kiveton Park on 25 June 1910 which gives some credence to the fact that he might have played there. The club is still in existence playing in the Sheffield & Hallamshire County Senior League Division Two South and play at Hard Lane. Also the club certainly existed in Cartwright’s younger days as the club was affiliated to the Sheffield FA in 1883, and is reported to have been playing six years before that. By the 1920s they were active in the FA Cup playing in the qualifying rounds. There is also another Arsenal connection with Kiveton Park: it was the home town of Herbert Chapman, and the town in which he stayed with his brother Ernest in the days leading up to his passing. Coal mining was the prime industry of the town from the Middle Ages onwards, and in 1866 Kiveton Park Colliery was opened, making it one of the earliest deep mines in the world. The pit closed in 1994. 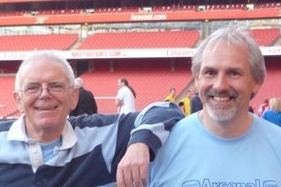 However the alternative (or perhaps complimentary) story is that Sidney Cartwright joined Arsenal as an amateur from High Moor in April 1931 before turning professional one month later. But this gives us a problem, because according to the Football Club History Database, and indeed the other sources I can find Highmoor FC was formed in 1989 when it joined the Reading League. In 2001 it merged with IBIS to form Highmoor and Ibis. There is no reference to High Moor FC (ie the club name written as two separate words). Now I have done quite a few searches to lesser known clubs over the years and usually come up with something, but this time, I confess I am stuck. Dean Hayes has Cartwright playing for High Moor first, then Kiveton Park, so maybe High Moor was a junior team of the 1920s for which no records exist. However I can’t even find a town or village called High Moor. There is however a Highmoor in Cumbria and one in Oxfordshire. Whatever happened before, we can say that Cartwright signed for Arsenal as an amateur in April 1931 and as a professional on 9 May. He made his debut on 22 Feb 1936 against Portsmouth. Cartwright then played five games in 1935/6, 2 in 1936/7, six in 1937/8 (scoring two goals) and 3 in 1938/9. He stayed on Arsenal’s books during the war but he didn’t play for Arsenal during the war, and I can find no record of him playing anywhere else. By the end of the war he would have been 35 and so would not have been seeking a new team. 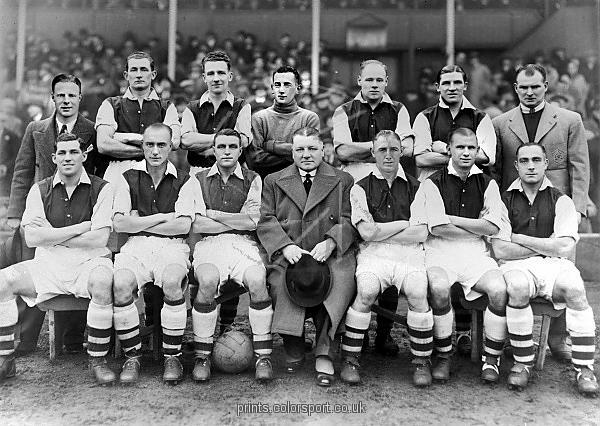 There is one curious picture of Arsenal supposedly including Sidney Cartwright – a team group picture for 1937/8 in which the player on the far left in the back row, dressed in jacket and tie, is said to be Cartwright. Why he is in the picture along with 11 players in their kit, plus George Allison and Tom Whittaker I really don’t know. Any info would be welcome. Front row: Alfred Kirchen, George Hunt, Eddie Hapgood, George Allison (Manager) Leslie Jones, Cliff Bastin, Wilfred Copping. His final game for Arsenal came playing left half in April 1939, this being a 2-1 home win over Manchester United on April 15. There is a record of him serving in the Army in the Second World War and later returned to Yorkshire on demobilisation. He died on 16 December 1988. Dave thank you so much for that. Much appreciated. Killamarsh in 1951 and in fact was captain. Also I was sad to hear that Sydney died in 1952. I have a photograph of the team which he captained. I am doing my family tree and my sister is married to Sid’s nephew Steve. I found this by adding Sid to our tree. Really interesting to read…. SYD Cartwright was my godfather and his wife Eileen gave me a London medal to remember him. I was born at High Moor, Killamarsh the son of Eric Walker. The Walkers and Cartwrights were very close friends.